Hi! I’m Jason Cirillo from Choice Provisions, the creator of a game called Woah Dave! This is my first time writing for PlayStation.Blog and I’m super stoked to share our new game with you. Woah Dave! will be coming very soon to PS4 and PS Vita, and will feature all the cross buy support you could ever want. Woah Dave! is one of the first games released under our new MiniVisions label, and we couldn’t be happier. The goal of MiniVisions is to create smaller games with a focus on pure fun, and Dave definitely delivers! 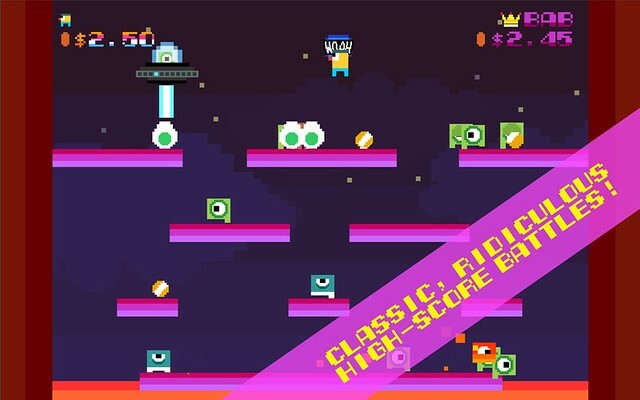 If this is the first time you’re hearing about Woah Dave!, then you’ll probably notice that it’s very heavily inspired by some of the most popular arcade games of the 1980’s. It’s not just another homage to retro games, however, as the chaos and challenge is ramped up to satiate the needs of the modern day gamer. It’s a simple little game, but once you’ve played it, you’ll understand why some called it the funnest game in the Indie Megabooth at PAX East! The game is a classic high-score competition with pennies being your only means to score points. I’ve managed to break $4 once… think you can beat that? One thing the keen observer might notice is that there are no traditional levels and bosses like you might be used to seeing in platform games. Woah Dave! has a sneaky progression system wherein the difficulty ramps up and the platforms change slowly over time, and in a more organic fashion. New enemies will be introduced as you begin to master the game, and these enemies will change things up in totally unexpected ways. 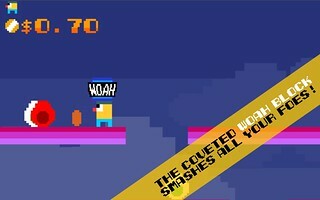 The more skillful players will also manage to unlock “Bonkers Mode,” which is in our opinion the “real” game of Woah Dave! If you’re unlike me and have real friends, then you should get ready for lots of good ol’ screaming and yelling as you play local multiplayer mode on PS4. You’ll have two minutes to come out on top against a friend in a tug-of-war, coin collecting battle. It’s hilarious, fast, and insane — just like the games mom used to make. We hope you’ll give it a try, because we think you will totally love it. I’ll hang out here and take any questions you might have! Thanks for reading! Looks like a frantic nightmare, but in a good way! 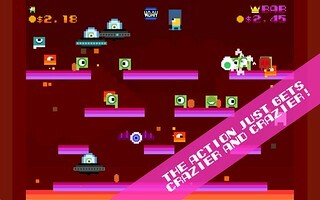 Will there be multiplayer available on Vita as well, like through ad hoc? Multiplayer will only be on the PS4 for the time being. You had me at the faux cabinet art. Believe it or not, there are actual Woah Dave! cabinets. We brought these to PAX East and PAX Prime. In fact, the cabinets were the first incarnations of Woah Dave!, so technically the Vita and PS4 versions are actually arcade ports! The art you see above is, in fact, a 3D rendering of the actual cabinets. this game looks great! perfect type of game to play to/from work on the vita. i’m hoping this is part of the igc, if not hoping no more than $10. It will definitely not be more than $10. :) Stay tuned for pricing information! I am taking this as a compliment. So I assume you’re buying it then! Thanks! These other posters really make me wonder with responses like that, and must be getting free download vouchers. If you want to re-hash old school arcade, then bring us something. So many past releases, that makes this not even worthy of being added. Some of the mobile games given away for free are better than this. Good bye PS Plus and being worth something, hello Xbox junkade. No free download vouchers for anyone, if that’s what you’re implying? As a company, we pride ourselves on our ethics as well as our ability to eat an entire block of Velveeta cheese without getting too sick. If you give the game a chance, we’re pretty sure you’ll have a lot of fun with it. Coming soon… Does that mean 2014 or 2015? Little veg on your release date information now aren’t we. Gaming site’s like to narrow down to a window time frame. I myself run a gaming calendar to keep myself and anyone subscribed informed on what game’s are coming next. Fall 2014! Quite possibly next month! Loved the Bit.trip games and I’m sure I’ll love this! That’s very kind, thanks! We worked super hard on it. Nice. You can see the Joust and Mario Bros influences. People are judging the (intentionally retro) visuals but don’t realize how pure of a gameplay experience this looks to be. Anyway, I will get this to support the existence of that arcade cabinet artwork alone. Thanks so much! Yeah, we certainly realize that the game isn’t for everyone. But for the kind of people it *is* for, we think they’re going to be pretty stoked on it. I am thinking this is a dollar title, which is the same price it would be on mobile? It will be more than $1, but not much more. It will also be cross-buy!! It has leaderboards? I’m going to crush your score, just you wait. Muahaha. I played this @ PAX and can say it is amazing. I kept coming back to play. ADDICTING, fast, and FUN! Simply can’t say enough good things about this game. My high score was 2.84, and that was HARD!!!! Wow! Thanks so much! This upbeat, positive comment has earned you an e-hug. You should donate one of those Woah Dave cabinets to High Scores Arcade in Alameda, California. They’re a fully interactive arcade museum, and very dope place who I’m sure would take excellent care of your machine. LOL dudes, thats the ludic school **** i’v been waiting! Thanks so much! 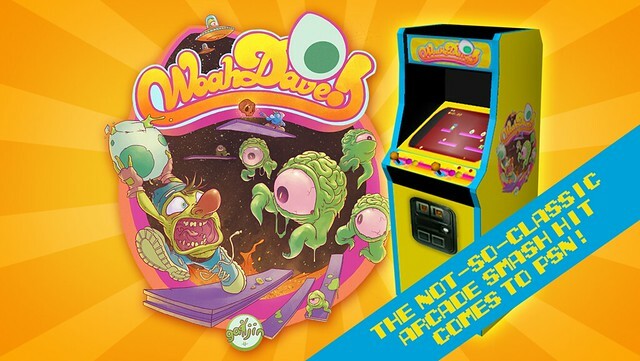 If you like old-school, high score-based games, you’re going to love Woah Dave! I give you guys a lot of credit for not only responding to the praise, but also the negative messages. Game looks interesting. For sure! You can’t please everyone, but everyone’s opinion is still worth respecting/hearing all the same. Multiplayer on PS4 = purchase on day 1. I love indies since a lot of them are unique and fun and this certainly looks fun so I am definitely going to check this out. Also Jason thank you so much for bringing this to the vita as it is my most fav gaming platform of all time!! I guess you people are the “i am going to judge a book by its cover no matter what” type. If you don’t want to buy it then don’t leave negative comments about. At least try it first. People at pax claimed it to be fun. Though being ignored is ok to, if the questions are not actiually answered. You’ll have to pardon my displeasure of my Vita / PS4 comments. Vita could so easily be the Biggest Console Ever, if Sony actually tried, with SO many PS2 and a few PS3 titles to bring over. That and waiting for a decent mobile handheld since Gameboy. As for PS4, its like they completely disowned past systems and classics, not too mention losing MP3, CD, and now pay for online. And this and a whole week of upcoming new releases, that do not seem much better than the past. Why can’t I just get impoved versions of older games, without the premium price of acting like its new? Stories have always been timeless, but this is just rinse, recycle, repeat. Sorry if we missed it – what was your question? Just looked at your first post and it didn’t appear that you were asking anything. If you simply just cut and paste over past designs, you would think some real improvement would be made. No good sales this week, and not seeing much in the future noteworthy. Then maybe Sony should have more follow up posts about games purchased ,verified by ID. Without B.S. freebies going to team members or friends for better ratings. Its so easy to tell its fake, do you even go outside anymore and go anywhere without your friends? Online usually isn’t much different. The first rating hit Prime took after 25, was probably the only real buyer so far. 25 buys, and not one rated less than 5, get real. Mayhe if you had a follow up post about sales before the sale was up, I could give more positive feeback. But all we normally get is hype, and then on to the next one. I figured as much! Take care. Wow you are really trying your utmost best to pull up anything you can get your grasp on to act as an point, aren’t you? I must ask (although I fear that you will again use the same “no friends, always online” bs) what part of this is fake to you? I know how it will play and if priced right I will definitely check this out. Also are you aware that frozen synapse is actually an amazing game? If you haven’t played it on pc surely you must have read some reviews, no? Or is it that ego of yours forbids you to trust anyone pinning them out as “friends of the dev, free codes, biased review” kind. You left me enough rope, so sorry for the reply. Reviews that were given by people given vouchers, and posting 5 star feedback. I am not saying it might not be an amazing game. But not one in the first 25 people rated less. Much like posts being given a 1 rating and within less than a minute up to past 4. Doubt it is Sony, but developers. Much like tryng to block / ban customers with less than praise, by provoking fights and trying to make it personal. For complaints, which in the “Real Word” we all know can be way more often. True sometimes stuff like that do happen (a lot on steam e.g. Earth 2066, Air control, etc.) but they are less frequent on psn. Honestly though if you depend on psn ratings then it’s sad. Those ratings are not to be taken that seriously. Many people may end up rating a game they like with a 5 star. I did it with SAO (even though its fanservice may turn many people down) and with borderlands 2 (even though it has framerate issues among a few others). If you want real reviews or score for a game then go to site that you can trust or watch gameplay videos of it. Here I’ll help you, for reviews you can go to The Vita Lounge or PSVitareviews.net and for video reviews you can go to bluemaxima’s youtube channel. Yes… It’s retro. For game purists.. people who can judge a game, not by the amount of progressive scanlines, but by weather it’s fun to play or not. No… It doesn’t look better than inFAMOUS Second Son. Yes…. I WILL be buying this! PS: If you guys want to break into my place and leave a Woah Dave arcade cabinet I will NOT press charges, and that is my guarantee to you! Wow, thank you so much! We’re breaking into your house right now! I get unreasonably frustrated when I see “whoa” spelled as “woah”. I don’t know if I’ve ever had one, but I suppose this is possibly my one pet peeve. I legitimately can’t stand to read when someone uses “woah”. I have no clue why. I am not trying to “bash” the true arcade enthusiasts out there. Nor, am I trying to say anyone with half a brain would enjoy it. or for that matter a PS4? When IOS games are ported at a major price hike? Or they seem to already be making definitive editions for PS4? but week after week of nothing but games like this? And more hype than anything else? This should be one of the biggest websites for games, instead its just posting info that usually is lacking anticipated titles, and showing pictures of games that may or may not deliver. Stinks that games like Need for Speed Most Wanted sold for $5 bucks, and yet paid the same for Lone Survivor. Or other more deserving titles, insead of deleted content that did not deserve the support. WRC 3 for that matter, when there is No Demo available, mediocre reviews, and I would have paid more for it had I known what it was worth to me. Too bad I couldn’t see if 4, was actually any better. And Sony, PS Now, is not a very good solution. Your timed trials were much better if they were available. As a vita owner…..no, a vita LOVER, I can understand how you might feel about the current situation. Personally this year I was holding onto the hope of Sony bringing us an infamous vita. Honestly that was one of the megaton I was expecting during e3. But what happened was at e3 fft0 mess up happened and at gamescon vita lost an exclusive to the ps4 (Tearaway in the form of a definitive edition). I must admit though TGS was better since we saw that a new YS game is coming to vita and I am super excited for that! Anyways personally I believe Sony did not abandon the vita but we will not be seeing much support for the handheld untill or unless Sony starts to make profits again. Since they are expecting a huge loss of $2 billion they are trying to cut down those losses with the help of its most profitable platform, the ps4. Thus most if not all of Sony’s 1st party devs are working on ps4 exclusives to keep the strong sales going. Also Sony themselves said that the “economies of AAA does not work on the vita” meaning AAA games aren’t profitable on the vita. @Rezolution77: I think your head’s still stuck in that “dark place.” Anyone wanna help me pull him out? I m not trying to judge the game, I hope they make a boat load of money off of this and anything other companies make. Im sure its a great game. My point was that we have a “next gen” system….sony’s words, and they keep releasing some 8bit style games. When the SNES came out with Mario bros. what if they came out with the exact same title same levels with maybe one new one each release but kept changing the last part of the name to MB HD, then MB Super HD , then MB Super XHD then MB 4k…its the same game don’t you think people would get tired of it. And the fact that we are conversing on THIS page brings more attention and communications between gamers…so it helps this game too. @37 But selling more Vitas would be. And I didn’t say AAA ,though I have lost all meaning of what that is anymore. But your saying, HD remakes, or originals at greatest hits prices? Is not possible? Bet alot more Vitas would have sold. Or better yet, PSP and PSone titles not being on PSN? This is not new development we are talking here. But not having titles, like FF Crisis Core, or Kingdom Hearts? And I am sure there are more. I mean not even YuGiOh for PSP is on there. Copyrights possibly, but what about SOE games? Mega Man X4 already has 500+, and was wanting that one years ago. And although Guacamelle was great, it was 3 times the price originally,with no CrossBuy. Fair enough. But as AAA titles takes time, even creating indies which looks awesome graphically, these act like the appetizers to the main course and just like Sony said are here to fill in the gaps between larger releases. Doubt there would be many replies. @42 then do it with PS2 ports and make some money. I probably played on it more, than my PS3. And get the PSP / PS ones , a little more credit with some trophy support and better pricing. I know some Plus users were upset with free PSP games, but I and some others liked it. Nothing major but a completion trophy shouldn’t be too hard. Better yet, instead of posting games like this one, why not try an old school marathon to get people to play more by having contets to come up with trophies. With blogs, and feedback for a game of the week. Don’t be afraid to post, I like reading comments, and opinions. Picked up Game of Thrones that way, and though bargain bin, the intro was interesting and look forward to more of the story. The fact that Choice Provisions is bringing this game out on the PS4 and PS Vita is not holding other companies back from releasing AAA or “games with better graphics” out on those systems. They are in addition to. You should be happy that companies are releasing games for them even if they are not your style of game. Some people act as if Sony is going to see Woah Dave coming out on the PS4 and think to themselves… Hmm.. perhaps we should cancel The Order:1886. This is simply one additional game of choice.. nothing more, nothing less. Correct. Nothing we do has any influence over what other developers do. We’re a very small team with a love of retro games, and many of our games reflect that. Everything costs time, resources and money. ps2 HD remakes, ps2 emulation and also incorporating trophies into psp and ps1 games (with a vast number of games that is a lot of work). Like I said, Sony can’t afford to do something that won’t bring them much money or from which they may make losses. By greatest hit prices are you talking about games at a discounted price? But isn’t this the whole problem? If people always waits for discounts and doesn’t support a game by purchasing at full price ($40 for larger releases and $20 or less for Indies isn’t much) how do you suppose that Sony will support the vita then. Games costs money to make. A whole lot of money if you are looking at killzone mercenary or uncharted or tearaway. If the revenue earned cannot justify the various costs associated with the project then the dev or publisher won’t have the interest to continue then. Also every month and infact every week Sony has sales going on. Surely you can’t expect tge sale to be of your liking every time? By greatest hit prices are you talking about games at a discounted price? But isn’t this the whole problem? If people always waits for discounts and doesn’t support a game by purchasing at full price ($40 for larger releases and $20 or less for Indies isn’t much) how do you suppose that Sony will support the vita then. Games costs money to make. A whole lot of money if you are looking at killzone mercenary or uncharted or tearaway. If the revenue earned cannot justify the various costs associated with the project then the dev or publisher won’t have the interest to continue then. Also every month and infact every week Sony has sales going on. Surely you can’t expect the sale to be of your liking every time?